1.- What features has my booking ? All our bookings are for only authorized taxis by the Barcelona Metropolitan Area. All our bookings are private transfers, never shared with other clients. In our transfers is included, a time of courtesy waiting at the meeting point for 45 minutes for transfers from airport, monitoring flight status, all extras like: suitcases, wheelchair, baby stroller, baby seat or booster, pets with an IATA container and the price of the Taximeter. Bookingtaxibarcelona.com offers additional information via email. Click on the “Other Origin” or “Other Destination” icons in Services page. This way you can send an email explaining these points where you want to be picked up or where is the destination . We will give you a price for this route. 3. How much luggage per vehicle is allowed ? You can check the baggage allowed for each vehicle clicking here. On the bottom of the page you will know the capacity of each vehicle. In the process of purchase of the transfer you can enter the carry luggage, quantity and size. If you need to bring more information, using the area Additional Information in the checkout process before finalice your purchase. If you’re wrong when you book your taxi for the size of your luggage, we will refund the amount without any extra cost. You can explain in question and tell you based on people you traveling and luggage using the area Additional Information in the checkout process before finalice your purchase, whether it will be possible to incorporate without type of fee. In the event that is not possible, we will advise the type of vehicle you should book. If you decide to change the vehicle you can booking the transfer with the correct type of car. We will return you the amount of the first transfer you bought. In Barcelona, ​​a child holds the position of a person so if your family are 2 adults, 2 children and a baby, actually you need a taxi for 5 people. If you need baby seat you will tell us how many you need and ages of the children using the area Additional Information in the checkout process before finalice your purchase. This service is without additional cost. Know that for transfers within the city of Barcelona, ​​the baby seat are not mandatory. We don’t offer baby seat service for transfers within Barcelona. 6. We have a baby stroller. Is it possible to carry it? Yes, please indicate using the area Additional Information in the checkout process before finalice your purchase. This service does not have any additional cost. 7. Travelling with wheelchair. What should I do? Please, enter this information using the area Additional Information in the checkout process before finalice your purchase. Very important, the wheelchair must be foldable. Obviously, this service has no extra cost. If you travel with your pet, please indicate using the area Additional Information in the checkout process before finalice your purchase. Pets must always travel in a container that meets IATA regulations, as for travelling on airplanes. This service does not have any extra cost. 9. Will I be taken and collected directly to my hotel or private address? Yes. All our private transfers will pick you up or take you to the address requested. 10. Is it possible to stop during the travel to pick up the keys of the apartment or residence? Yes, you can make a stop to leave a partner of your group or pick up the keys of the apartment. This stop should not exceed 10 minutes and must occur within the same route of the original transfer. Please, use the area Additional Information in the checkout process before finalice your purchase and enter tis information. Bookingtaxibarcelona.com accept reservations up to one hour before pick up time for payment service Paypal. For services to pay by credit card, cash reserved by telephone or via App can reserve a minimum of 15 minutes. 1. What documentation do I need during the travel? You need to carry two printed copies of the booking confirmation that you received when you bought the transfer. Click here to see the example. You must to bring one copy signed for you to the driver at the meeting point. The driver needs to keep one to confirm that the transfer has been done. Also, do not forget to take essentials such as ID card, passport, credit cards, airline tickets, mobile phone charged. Click here to see an example of Booking Confirmation. 2. Where are the meeting points? At the Airport, Port or Train Station can check the meeting points clicking here. At the Hotels or Apartments, the driver will be waiting at the reception with an advertisement with the name of the client. For other addresses, pick up address will be the exact point that you introduced in the booking form that you received by email when you purchased the transfer. 3. How many time will be the driver waiting for us at the meeting point at the Airport? Our Call Center is controlling all time your flight. Don’t worry about anything. The driver is sent to the meeting point when the flight lands. The driver will be waiting up to 45 minutes after the flight landed and not when the flight was scheduled. In the event that a member of your group loses a suitcase, is injured or is being held in customs, please send someone from the group to meet with the driver to inform him of the incident. This overtime must be paid to the driver in cash or credit card. The fare is 20 € the hour wait. For example, if the delay is 15 minutes ( after 45 minutes included ) an extra 5 € will be charged. You can also call us at +34 933 128 050 or send a Whatsapp at +34 620 987 948 always referring to the order number. Use the Wifi free access that offers Barcelona Airport. As we explain in 3rd question, we control every time the flight status so don’t worry for anything. 5. What happens if my flight is canceled or I change my flight for some reason? Remember that if your flight is canceled and are traveling in another must notify via email to cancel_modify@bookingtaxibarcelona.com or by calling +34 933 128 050 within 60 minutes of the first scheduled time or 120 minutes for services from Girona, Reus or Lleida airports. Always mentioning the order number that appears in the purchase confirmation of your transfer. At this point communication via Whatsapp is not available. After that time, the amount of the purchase can not be returned. 6. What happens if the driver is delayed? It is very unusual that occurs. We have a geolocation system in our fleet and the transfer is assigned to the vehicle with a minimum of 15 minutes up to 2 hours for pickups outside Barcelona (this included in the price of the transfer). In the rare event that the driver arrived late, please call us at our Call Center at +34 933 128 050 and our department will assist you immediately. You can also send a Whatsapp +34 620 987 948 always referring to the order number in both cases. You can only consider the driver late if he isn’t present for your collection up to 10 minutes after the fixed time on your booking confirmation. 7. The details of my trip has changed. Can I modify my data transfer? Yes, you can change your data transfer until 60 minutes before the scheduled time. In collection for Girona, Reus or Lleida Airports that time should be 120 minutes minimum. To do this, please send an email at cancel_modify@bookingtaxibarcelona.com or calling at +34 933 128 050. In this point, via Whatsapp is not available. After that time, the amount of the purchase can not be returned. 8. I want to cancel my transfer. How I can do? Any transfer can be canceled without charges until 60 minutes before the time of collection except Girona, Reus and Lleida Airports that time shall be a minimum of 120 minutes. 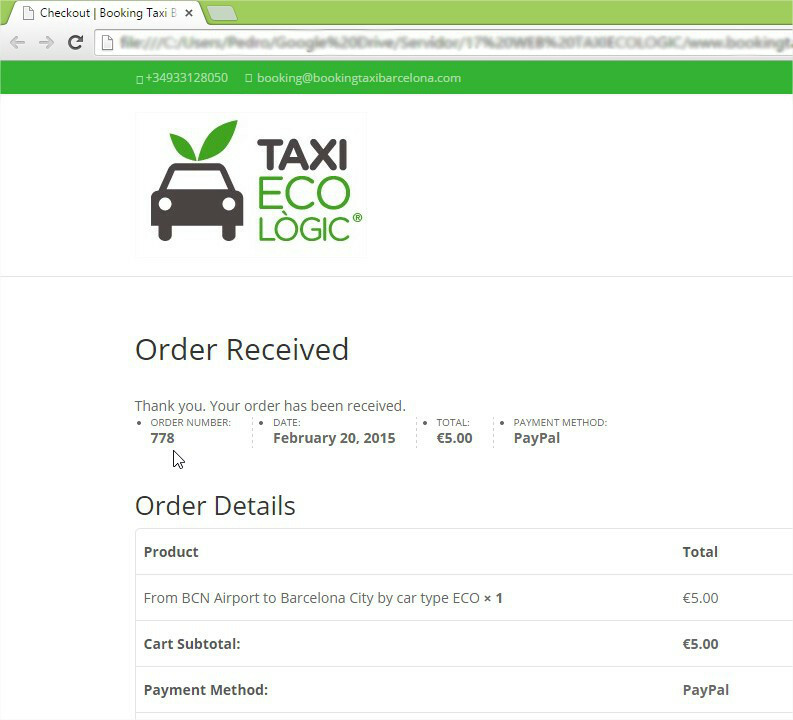 To do this, please send an email to cancel_modify@bookingtaxibarcelona.com or calling +34 933 128 050. At this point communication via Whatsapp is not available. After that time, the amount of the purchase can not be returned. 9. I paid my reservation, but I have not received mail the form to fill out with my details. The booking confirmation forms are processed quickly and sent shortly after receiving the confirmation of the payment. If after a regular time you have not received your form, first check had not received our mail in your mailbox “Spam folder emails or rejected.” If so, add our email booking@bookingtaxibarcelona.com to your address book to prevent this from happening in the future. If you have not received, please write to our email and tell us what other email address can send the form. 10. Do I need to reconfirm my transfer? No, we take care of everything. Days before each shipment we confirm all transfers with our drivers. Just remember to bring a printed copy of the signed booking voucher and hand it to the driver. You need nothing more. 11. Our group arrives in two separate flights but we would travel in the same vehicle. Is it possible? As the flights are usually delayed, we do not recommend this type of service. From our Call Center we take responsibility for the control of a single flight. Enter in the form what flight will be the principal. Remember that any extra waiting time, will be paid in cash or by card to the driver. In service with various destinations to different terminals, there aren’t any extra charge for leaving part of the group in a terminal or another.